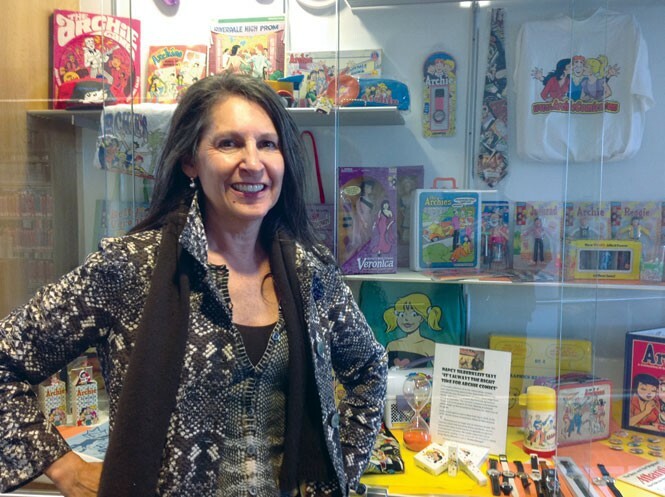 Nancy Silberkleit is the co-CEO of Archie Comics and also has one of the biggest collections of Archie memorabilia, which she acquired not from the company storage unit but during years and years of scouring antique stores and bidding in online auctions. Earlier this year, she set up her collection as an exhibit in the Mamaroneck Public Library in New York, and it's since traveled to the Salt Lake City Main Library (210 E. 400 South, 801-524-8200, SLCPL.org), where it's on display on Level 2, along with an Archie journal, where people are encouraged to write their memories of Archie. 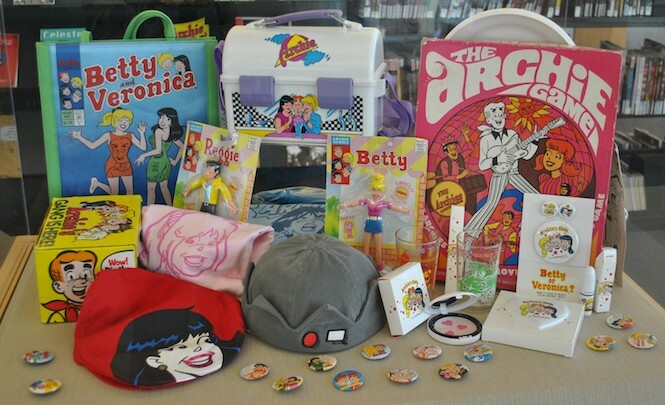 Why do you collect Archie stuff? It was part of my husband and his family. He wasn't into preserving. When I first met him, the first time going to his place, I remember seeing a 10 cent comic book lying on the floor that was moldy and dirty. I was like, "Ack!" I've always been involved in collecting antiques—furniture, frames, whatever; I love the preservation of history. And there was nobody that seemed to have any interest in it, so it was just something I would do. I'd go running up to my husband and say, "Honey, look what I just came home with! I found a lunchbox in an antique store! And look at this puzzle!" He wasn't into things like that; I was. And most people are into collecting the comic books—I wasn't into that. It's mostly the items. I have this baby jacket that was made for my daughter—it has the Archie logo on the back. My husband asked me if I wanted one; I didn't want one, but I regret that now. That's what I think about—the ones that got away. Why didn't I buy that? There were these sheets—I didn't buy them, and now I'm always looking for them. We hear about stop bullying, stop bullying, with the emphasis on tolerance, inclusion ... But what about when it happens to you? What do you do? If a person can get involved in something, if they ever happen to encounter behavior like this, it can help them. But people have passions for things, and people collect all sorts of things, and if you think about bringing it to another level of organizing it, and sharing it ... to become knowledgeable about anything, what happens is, you have confidence. It empowers you to have some self-respect. When people are targeting you to try to define you as something they want you to be, hopefully a light bulb will go on in your head. "I'm not that. I know about this. I'm an expert on this." Or "I play sports" or "I sing beautifully." When you think that you can show people things that you take pride in, and you have knowledge on, it builds confidence. I'd like to put that out there to people—caregivers, teachers—to think about getting people interested in something. Do you think hanging on to things from childhood is becoming more accepted? It is. My daughter has a lot of stuff here, and boy would I love to throw it out, but I don't dare. But what happens with collections is, they take up room, a lot of space, and they're never looked at. So I'm happy to have moved this out of my drawers. And honestly, I don't think I'm ever going to see it again. There's not hope for me to be around long. I'm not getting younger, I'm getting older, and things start to break. I'm happy that I have let this go. I'm hoping it will end up in the Smithsonian, and I just hope that we can have the libraries propel it around the globe and let people enjoy it. It's colorful, it's interesting. How did your collection become a library exhibit? I had it for a while, and I didn't really have it as a collection—I had stuff, in drawers and all over the place at home. A mother reached out to me and said, "My daughter is doing a project on Archie comics, and she would like to know if she can interview you, but she also needs documentation of any history you have." 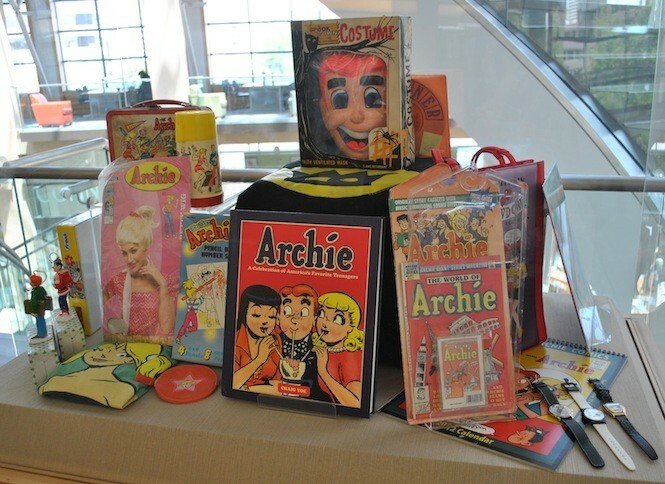 And I said, "I have many Archie items; I'm not sure what I have; I never organized it. I also have a box of news articles done on my husband's watch, and I never went through it. I don't know what I have, but you can come interview me." When they came to my house, I gave them that stuff, and they said they preferred my personal articles because it was so colorful. When they got it so nicely organized and cataloged on a disc, I felt safe that I could loan it out, and know what I'd loaned out. Why did you let your collection out into the wider world? I started hearing the feedback from the exhibit at the library in Mamaroneck, about how people enjoyed it and were engaged in conversation, and reminiscing. 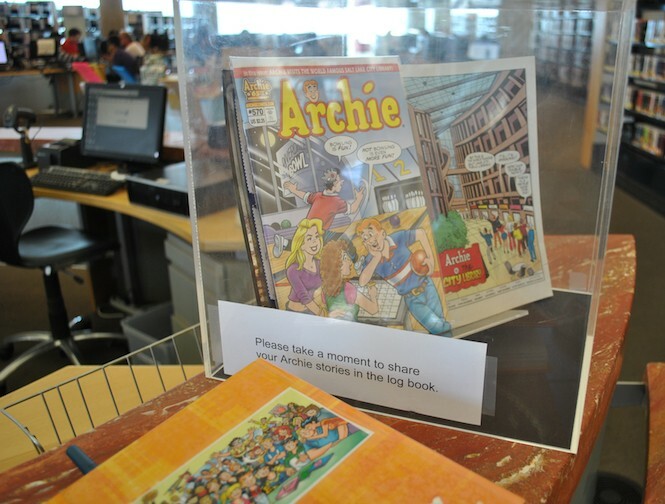 I love to hear from people around the world about how Archie impacted them. Archie seems to be part of childhood. A childhood would not be complete unless they had experienced Archie comics. Archie has been with us for seven decades, only because the conversation of people. It's the conversation of people that have propelled the brand. It comes up time and time again, with men or women, with an 8-year-old or an 80-year-old. It's ageless—are you a Betty, are you a Veronica, are you a Jughead. These characters are fantasy, but they've taken on a life because people see themselves as part of Archie and the gang. I spoke to Michelle Obama in a meet-and-greet line and told her what I did. She stopped and talked about Archie for so long. Imagine, the first lady had gotten lost in the moment and regressed back to Archie and the gang. She was beaming. And she was not beaming because of me—it was the brand. Archie brings this happiness into one's heart. Reading Archie for 30 minutes is like therapy. When I went into Archie, I had never read a comic book. I had never read my husband's comic books because. I had no love of reading. But once I stepped in there, I had to. When I brought the comics home and started reading them, I found myself stacking up a pile of my favorites, because I wanted to re-read them. Who's your favorite Archie character? My answer usually is Mr. Lodge. I admire Mr. Lodge for his involvement in business and how, just five years ago, I found a love for business when I stepped out of the classroom and into the ACP boardroom after my husband's passing. I paired my teaching background with business. It was my job for 25 years to figure out how to get our children interested in taking in information and learning. The same for business; it is my job to figure out how to grow the brand, sell comic books and keep fans like yourself engaged in Archie Comics. But I've branched out with my favorite character—it's Mr. Lodge's daughter, Veronica. I think Veronica gets shortchanged. She's looked at as a spoiled character, sort of self-centered, but I see Veronica as much deeper than that. She has the CIA in her—confidence, intelligence and allure. I enjoy when she's positioned with her father, because it's often in a business format. And she is always able to advise her father on ideas. She would be a very successful businesswoman, and would clearly be able to step into her father's footsteps. Sometimes she is on the outs with her Riverdale friends, but she knows who she is—she has a good mind for business and doesn't let the negative get her down. She will get things done, even with the roadblocks that may face her. And she does it all with charm, creativity and allure! I'm always trying to point out the stories that are great teaching tools in the classroom. I feel today's companies are always out front emphasizing people's causes, and the causes I feel a lot about is education and environment. I try to reduce and reuse my use of plastic. I no longer buy bottled water. In Double Digest 31, Archie & Friends, I was able to commission a story on plastic. A female ambassador from Rwanda comes to Riverdale High, gives a presentation, and inspires Veronica and Betty to think about reducing our use of plastic. That's the last story in the book, "Getting Drastic With Plastic." There's power in graphics to get information across. When you take this comic-book format, graphic literacy. You have a small amount of text. In between there, I call it the gray area, is where the reader gets to expand on the story. Once you start internalizing a story, you're putting it in your own terms, and hopefully you will react and utilize the information. I have a foundation called Rise Above Social Issues, where I'm doing comics about important issues.